Find hotel near Ria De Bilbao Maritime Mu ..
A life in the sea is one full of adventure and mystery, any salty old sea dog would agree. With ports acting as trading grounds as well as monuments of history, it’s only natural that there are entire museums dedicated to the Maritime world. The Ria de Bilbao Maritime Museum is such a museum and is filled with enlightening and fascinating information and objects of the Bilbao estuary and its port. Built upon the former site of the Euskalduna shipyard in 2003 this museum’s objective is to preserve and share the history, culture and identity of those who have thrived upon the Bilbao estuary. Bilbao began as a waterside town, and took advantage of its location to build maritime trade. As a result, it grew through the maritime trading industry being a major exporter of iron to England and the Netherlands. Located under a bridge, it was created with typical ship-building materials such as stone, steel and wood. Its fascinating range of naval artefacts and maritime memorabilia is divided into two sections: indoor and outdoor, and both comprise of temporary as well as permanent exhibits. Its permanent indoor exhibits showcase the physical transformation of the estuary. Today, the area has become a hub for leisure and entertainment, but its invigorated façade belies a long, colourful past. The themes this exhibit explores are: ‘the Estuary, a sea port’, ‘the Estuary, a market and factory’ and ‘the Estuary, a ship yard’. Coloured lighting, music and videos are used to create a feast for the senses and put out information in the most attention grabbing ways possible. The permanent outdoor exhibit is located on the outside docks and is filled with all kinds of floating vessels, such as tugboats, pilot boats and ships. Other machinery and devices from different stages is also on display. A Carola crane, rising up from the docks, has become a trademark sight of the museum. The museum has put up different temporary exhibitions which span a vast array of sea- centred topics, such as ‘A Century of Surf’, ‘RMS Titanic: How it was Built and Why it Sank’ and ‘The Song of the Whales’. All these exhibits teach visitors about the wonders that lie beneath the waves and provide fascinating insights. Numerous stunning photography and art exhibitions take place here as well, all drawing inspiration from sea life. These exhibitions keep changing, so no matter how many times you visit this museum, there will always be something new and interesting to discover. Touching or playing with the exhibits is not allowed. It is not permitted to take photographs inside the Museum building. Entry is not permitted with large bags, suitcases, and sharp objects, except for crutches and/or canes. The Museum offers a free cloakroom service where these articles may be left. Make a not that umbrellas are allowed only if they are folded and dry. Otherwise, please place them in plastic bags that are available from the machine provided by the Museum. For sanitary reasons, animals, food, beverages, plants, etc., are not permitted. Pets, except for guide dogs, are not allowed in the Museum. Admission for retirees, pensioners and over 65 years- 3.5 €. Student admission (maximum 26 years)- 3.5 €. Children under 6 years- Free. Access only to the dry dock- 3 €. There are different group charges (15+ people). Metro: San Mames station, Sabino Arana exit. Bilbobus (City Bus): Sagrado Corazon stop, 56, 62, A3 lines. 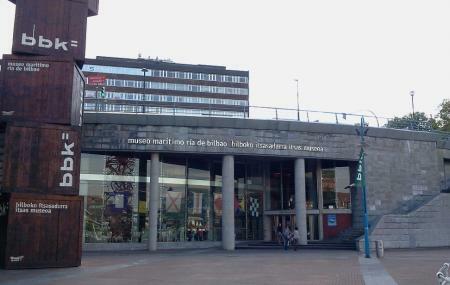 How popular is Ria De Bilbao Maritime Museum? People normally club together Palacio De Congresos Y De La Musica Euskalduna and Bilbao Fine Arts Museum while planning their visit to Ria De Bilbao Maritime Museum. Very nice little museum tucked out of the way. Easy to miss. It's worth seeing. Wonderful experience seeing the maritime museum. The restaurant was fabulous too.